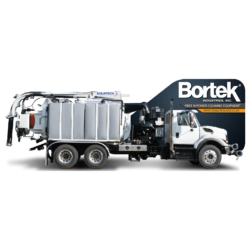 Combination Jet/Vac Sewer Cleaning Vehicles - Bortek Industries, Inc. 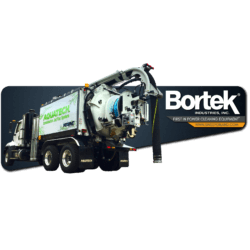 Ideal for any size municipality, water and sewer district, or contractor who is cleaning storm drains, catch basins and/or sewers. 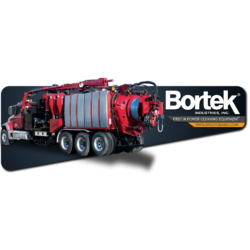 Also great for water leak repair, sewer line bypass, and emergency excavation. Available front-mounted or rear-mounted. The Aquatech Utility Edition is a combination sewer cleaner that provides a powerful, functional, and weight conscious unit at an affordable price. It has a 10 cubic yard debris tank, 1100-gallon fresh water tank, and 80 GPM water pump. The Aquatech CB Series is for vacuuming semi-dry material, especially from catch basins and storm sewers or any vacuum application where a jetting hose is not required. 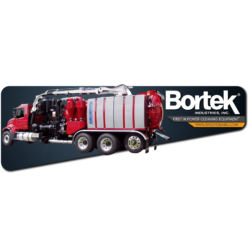 Ask us about renting one of our high quality environmental cleaning machines from Aquatech, O'Brien, and X-Vac. We offer both short-term and long-term rentals according to your needs. 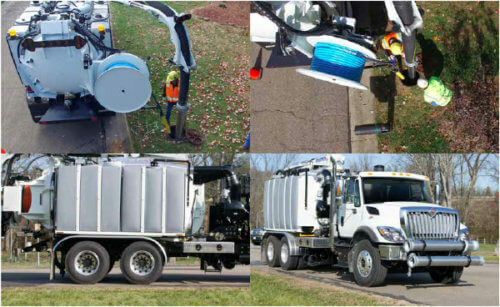 Whether you're an independent contractor or a municipality, we can provide the tools you need to complete tough sewer cleaning, hydro excavation, and catch basin debris removal jobs. Leave the vehicle maintenance to us!